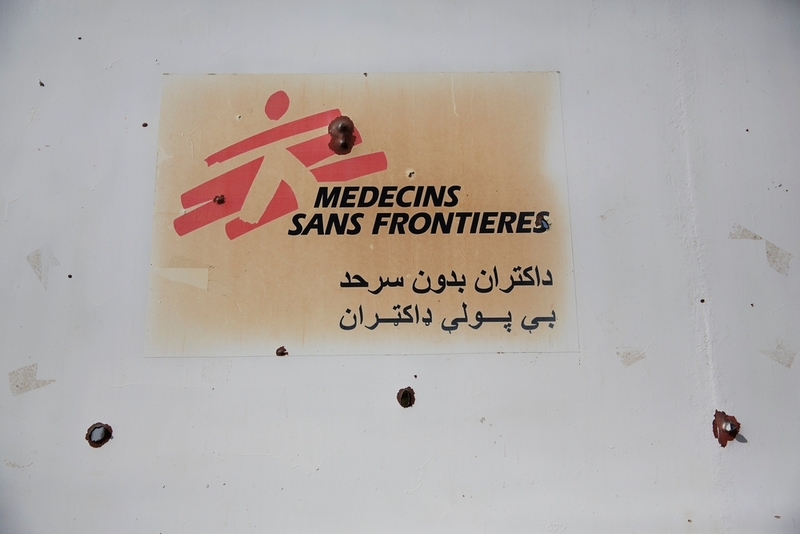 Nearly three weeks on from the US bombing of the Médecins Sans Frontières (MSF) trauma centre in Kunduz, Afghanistan, on 3 October, MSF today announces with sadness that the death toll is still rising, with one more MSF staff member confirmed to have been killed. One MSF staff member and two patients who are missing and presumed dead may be among the seven unrecognisable bodies, but ongoing forensic examinations have not yet been concluded. These unfortunately may not be final numbers. Holes mark an MSF sign on the front gates of the Kunduz trauma Centre, 14 October 2015 in northern Afghanistan. So far MSF also confirms 27 staff injured and also many patients and caretakers. Following the chaos of the attack, tracing patients has been extremely difficult and a definite number of wounded may be impossible to determine. Beyond the immediate death toll, the destruction of MSF’s 94-bed trauma centre will have a huge impact on access to surgical care for hundreds of thousands of people. This hospital was the only facility of its kind in northeastern Afghanistan, with more than 400 staff able to provide extremely high quality surgical, post-operative and rehabilitation care. Last year, than 22,000 patients received care at the hospital and more than 5900 surgeries were performed. 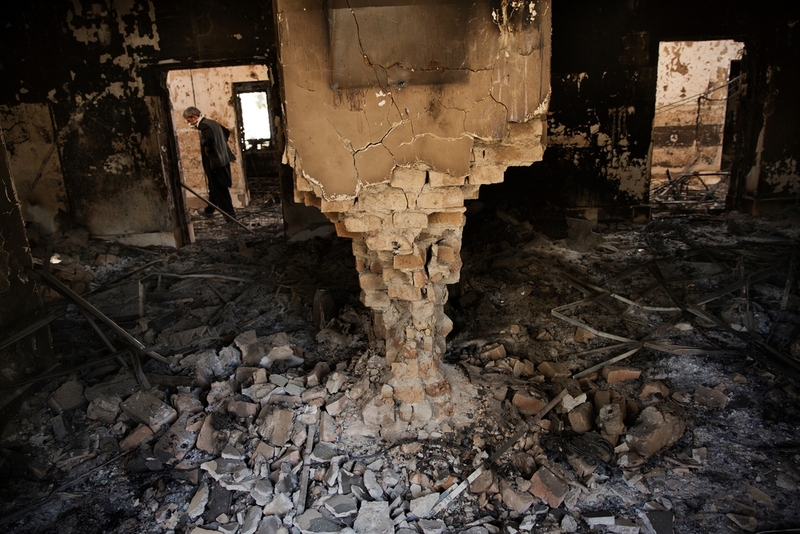 The charred twisted remains of steel bed-frame lies amongst ashes, 14 October 2015, in the burnt-out interior of MSF's Kunduz Trauma centre, northern Afghanistan. Staff treated anyone who needed medical care, often for significant trauma injuries from traffic accidents, bomb blasts or gunshot wounds. The emergency staff had been trained to respond to mass casualty situations – when large numbers of wounded arrive in a short period– and this was invaluable in the week leading up to the attack. When conflict was raging in the city and 394 wounded patients were treated, from 28 September to 02 October. 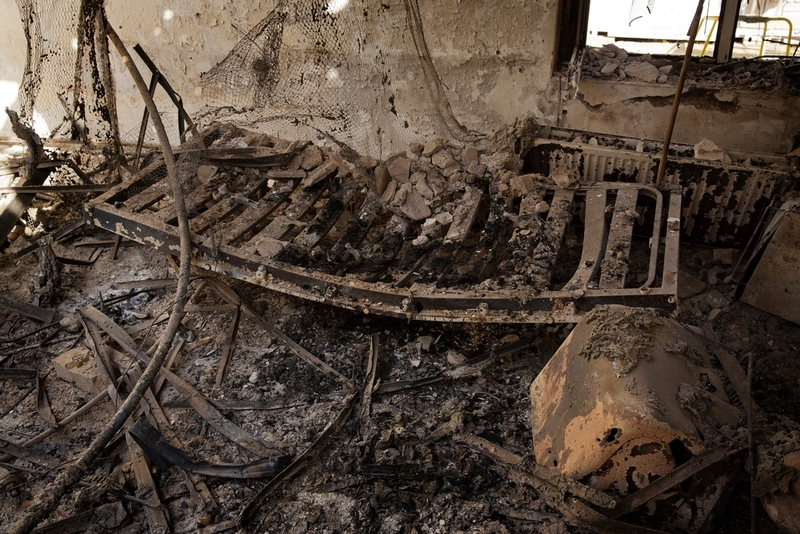 Medical equipment and the twister metal of a bed lies amongst the ashes, 14 October 2015, in the burnt-out interior of MSF's Trauma Centre in northern Afghanistan. Today, in a situation that remains volatile, the Kunduz Regional Hospital and a clinic at the airport are the only facilities providing free medical care in Kunduz town. They have received donations of medical supplies from various sources, including from MSF, since the attack on the MSF hospital. Ministry of Health staff have been relocated from other provinces to provide support. The surgical capacity in these facilities is limited and complex medical cases cannot be managed, meaning they need to be transferred to hospitals in other towns. A man wearing a surgical mask walks, 14 October 2015, amongst the debris of the damaged and burnt-out MSF Trauma Centre in Kunduz, northern Afghanistan. A small MSF team has returned to Kunduz to assess the damage, ensure appropriate collaboration with ongoing investigations and to follow-up on the welfare of our staff. 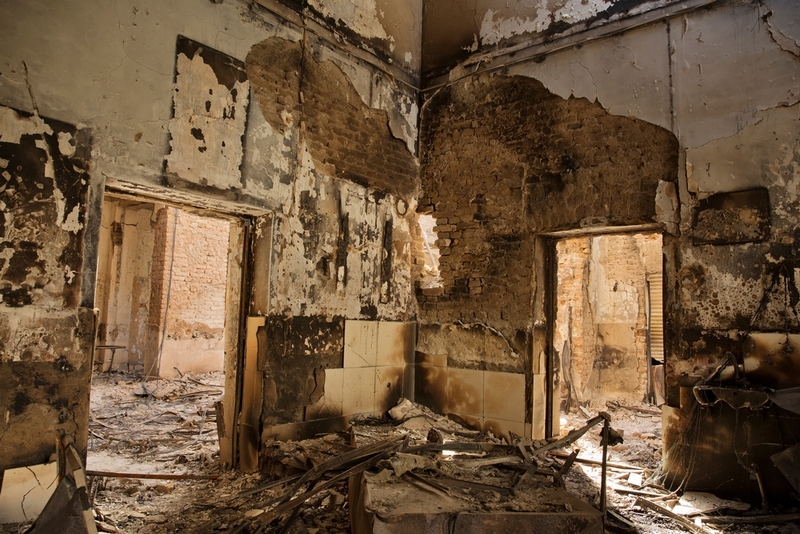 Unfortunately, until MSF understands what happened on the night of the attack and has strong assurances that it cannot happen again, the Kunduz trauma centre cannot be reopened. Our staff and patients must be safe. MSF started working in Afghanistan in 1980. MSF supports the Ministry of Public Health in Ahmad Shah Baba hospital in eastern Kabul, Dasht-e-Barchi maternity in western Kabul and Boost hospital in Lashkar Gah, Helmand province. In Khost, in the east of the country, MSF operates a maternity hospital. *Update 12/12/2015: The total number of people killed in the attack has risen to 42 after investigations were carried out on mortal remains found within the ruins of the hospital.